[Malte] is a loyal Hackaday reader and neurobiology PhD candidate with a keen interest in hobby robotics – definitely our kind of guy! He wrote in to share a project he has been working on in his spare time, a Kinect-controlled delta robot (Google translation). Deltares, as it is called, is pretty straightforward as far as delta robots are concerned. It uses three servos to actuate the arms, which are controlled by an AVR micro running BASCOM. The AVR gets its coordinate data from his computer via a serial connection after it has been captured by the Kinect. [Malte] opted to use Microsoft’s official SDK for the project, processing the Kinect skeletal data using a small C# application he wrote. The end result is pretty neat as you can see in the pair of videos below. In the first video, [Malte] uses Deltares as a plotter, drawing a crude face on a piece of paper with a marker. In the second, he commands Deltares with his right hand, using his left to activate the magnetic solenoid to pick up the steel spheres. It looks pretty cool to us, and we’d love to see what sorts of things he puts together if he ever ends up making robotics his career rather than a hobby. Very impressive build and a great project, all around. But everything built with RC servos is doomed due to poor precision and lack any sort of feedback, it’s just in delta robots it’s more obvious than in other types of contraptions. Did anyone try to build a similar monster with AX-12’s? I know that they are more intelligent and even provide positional and torque feedback, but do they have resolution? What about mechanical play? 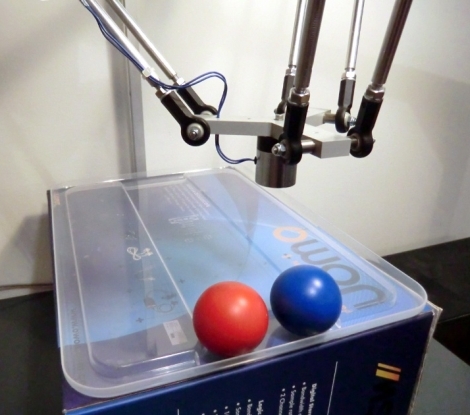 Linear drives seem to be more popular in hobbyist CNC machines, so why not in delta robots? They look more accurate and less expensive than giant servos, albeit at the cost of speed. However, from the example of the Festo bot, it looks like you could still get a delta robot with linear drives moving pretty fast. *ahem* How do you embed YouTube videos the way macona did? Just copy and paste the URL. You made such a beutiful job of making this thing but you did not tighten the pen in place properly?! !